I remember All Souls as I went there as a youngster, aged about six I guess. I cried my eyes out the first time. I later joined the choir and was there until I was 10 years old, when we moved to Lower Bevendean. I remember a Father Bott, the sacristan Mr Rhodes and Peter Kite, who was a very good tenor in the choir. I think a Mr Taylor was organist and choir master. I remember solemn evensong with Benediction, and priests prostrate on the Altar steps, which used to fascinate me. The incense used to get up my nose in the choir. At morning service Mr Rhodes used to follow the Vicar very swiftly down the aisle as he sprinkled holy water. I was confirmed at the church. I remember the elaborate Nativity Play with proper make up and clothes. We dressed in the crypt where the tombs were; I always found it very creepy. We performed the play in church on two nights and somewhere nearby for the elderly. 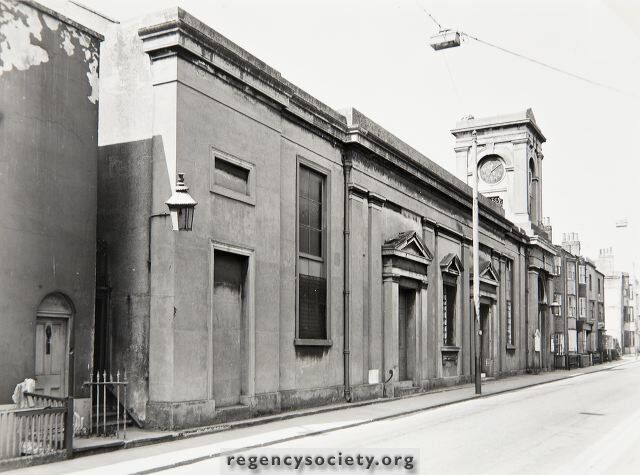 I used to enter the choir vestry from the Hereford Street entrance at the rear of the church. This was below the level of Eastern Road, and on the same level as the crypt I think. Mr Rhodes ran a boys’ club for members of the choir. I lived next door to him in a flat in Hereford Street and used to sometimes play with his daughter Catherine. I went to St Mary’s Church of England School in Mount Street, although All Souls School was available in Essex Street. I do remember the school caretaker’s son, John Brookshaw, who was in the church choir. I used to go to Saturday morning pictures with him at the Odeon Kemp Town. Sunday School was in the afternoon at All Souls School. I went to that as well as morning and evening service. My wife and I visited All Souls Church in about 1965, the year we got married. This must have been not long before it was demolished. Mr Munch, former Head of All Souls School, was welcoming people and handing out hymn books. It was sad to see such a small congregation and the extensive choir was no longer. In fact it is still sad to see much of my early childhood gone with modern redevelopment, including my old school. The father of a friend of mine recalls working at the church at the time of demolition, and all the tombs being removed; the bones were boxed and buried in a communal grave in Bear Road cemetery. I still look back at my time at All Souls with affection and gratitude. I seem to recall the demolition of All Souls took quite a while as they had problems with the thickness of the walls. I’m sure the Evening Argus ran a story about All Souls calling it ‘The church that wouldn’t die’ or something like that; I think they had to bring in a wreaking ball and close Eastern Road off for a time. Easter 2017 will be the 50th anniversary of the closure of All Souls’ and, in conjunction with St Mary’s Rock Gardens which is planning a commemorative exhibition at that time, I am preparing a booklet about the church and its history, helped by virtually all its records, registers, magazines etc., being readily available to access. I would love to have contact with anyone who has photos or personal memories so that these can be included. I have in my possession a medal which was presented to my great paternal grandmother and on the medal it reads ELIZ ELLIOTT 1898 NEVER LATE ALL SOULS SCHOOL BRIGHTON. I was wondering if this medal had anything to do with All Souls Church? My dad came from Brighton, my older brother and myself were in Bennett Road. We moved to Newcastle about 65yrs ago my mam’s home town. Hi Brian. Most likely this related to All Souls School in Essex Street which was the church school of All Souls Church in Eastern Road. Hi Brian. If you enter “All Souls Annexe” in the search box at the top of this page and click on “Go”, it will take you to an article about the All Souls School that Dennis has steered you towards, complete with photograph.